Buying property is possibly the biggest investment you will ever make, seeking professional help makes sense to potentially save you money. Buyer’s agents are licensed professionals who specialise in searching, negotiating and purchasing property on behalf of buyers. Waterman & Waterman Buyer Advocates are based in Adelaide and only purchase in Adelaide and South Australia. Waterman & Waterman are professional Buyers Advocates who act on behalf of home buyers and investors. We locate, investigate and negotiate you a property within your buying capacity. That will allow you to achieve your goals, whether you want to buy a family home, investment property or a development project, you will save time and money. Our Buyers Advocate will work with you to find the property you’re looking for. Our team provides personalised, professional service. Having access to statistics, data and evaluation tools that allow identification and assessment of higher capital growth areas. We are a proud member of Australia’s leading professional body for buyer’s agents. 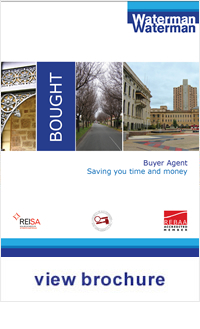 Real Estate Buyers Agent Association of Australia (REBAA). We offer two main services which is basically, you identify the property or we go and find the right property for you - your choice. Whether you are buying bed sit or mansion, whatever is your taste, we service all markets in Adelaide. We will find the right home for you and your family for the right price. Property has always been a cornerstone to Australian wealth creation and to any balanced investment strategy. We begin by reviewing your current position including any property investments and then develop a specific strategy for you to achieve your goals. We will focus on the most suitable type of property, location, growth and returns. This must also include an exit strategy and planning should you decide in time to sell. Our service for remote buyers are similar to those we provide for our local clients. However, we need to know if you wish to buy in Adelaide, will the property be an investment or are you coming to Adelaide to live and enjoy our sensational city and lifestyle. If you are not an Australian citizen the Foreign Investment Review Board (FIRB) has restrictions for visa and non visa holders in regard to property purchases. Click on the FIRB website for more information www.firb.gov.au. If you are not an Australian citizen you can still purchase property if you hold a temporary residence visa allowing you to remain for a continuous period longer than 12 months. All purchases must be approved by the FIRB before purchase is permitted. Your purchase will have to be approved by FIRB and we will happily review your available options.